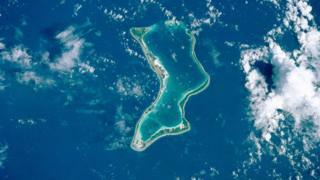 The UK should end its control of the Chagos Islands in the Indian Ocean "as rapidly as possible", the UN's highest court has said. Mauritius claims it was forced to give up the islands - now a British overseas territory - in 1965 in exchange for independence, which it gained in 1968. The UK Foreign Office said: "This is an advisory opinion, not a judgment." It added it would look "carefully" at the detail of the opinion, which is not legally binding. Referencing that, the Foreign Office said: "The defence facilities on the British Indian Ocean Territory help to protect people here in Britain and around the world from terrorist threats, organised crime and piracy." Judge Abdulqawi Ahmed Yusuf described the UK's administration of the Chagos Islands - located more than 2,000 miles off the east coast of Africa - as "an unlawful act of continuing character". He added the UK was "under an obligation to bring an end to its administration of the Chagos Archipelago as rapidly as possible". A "blockbuster" of an opinion from the UN's highest court. The judges' assessment was damning. At the heart of it, the right of all people to self-determination as a basic human right, which the UK violated when dismembering its former colony. Instead, it divided the territory - effectively using the process of decolonisation to create a new colony. Some of those who were forced to leave their homes on the Chagos Islands in the late 1960s hoped they would be allowed to return - and not just on one of the rare visits authorised by the UK. Speaking to the BBC last year, Samynaden Rosemond, who left when he was 36, said: "Back home was paradise." "If I die here my spirit will be everywhere - it wouldn't be happy. But if I die there I will be in peace." Several Chagossians gathered at the Chagos Refugee Group's centre to follow live the session of the International Court of Justice in The Hague. It was in an explosion of joy that the news was celebrated by both them and their descendants in Pointe aux Sables - a suburb of the Mauritian capital, Port Louis. "I dedicate this victory to the entire Chagossian community that is scattered in several countries around the world," he said. "It is a great victory as all the time we wanted to go gather on the graves of our families that we lost there [on the Chagos Archipelago]". Mauritian Prime Minister Pravind Jugnauth said the UK had always emphasised respect for international laws and, as such, expected the country, with which Mauritius has excellent relations, to respect the judges' opinion.